While you’re putting together your list of resolutions for this year, how about instituting a string replacement schedule? Your harp only sounds as good as its strings, and unfortunately strings do deteriorate with age and use. While it is obviously necessary to replace strings when they break, I would also advise you to adopt a regular schedule of replacing your strings even if they don’t. Without a regular replacement schedule, you might have an octave that includes two strings you just replaced, two more that you replaced a year ago, and four that have been on the harp for longer than you can recall. Hey, it’s great that those four strings never broke, right? Saves you some money, and we all know how expensive gut harp strings are. But that mixed-vintage octave is not going to make your harp sound as good as it should. Newer strings have more resonance and sustain than old ones, and as a result, your harp will sound uneven in tone. In addition, you may have most of your harp strung in gut, but there is the odd nylon string that you threw on in an emergency at a gig. While you had to do it at the time, now it sounds and feels different than the others. You mean to change it, you really do, but there just hasn’t been time. No more false strings. Change those darn things! I’m not saying you need to replace all of the strings on your harp every year, or even every two years. Some strings can sound good for much longer than that. Others tend to wear out more quickly. I will outline some proposed schedules below that break things down by octave, and you can you can choose one that best fits your budget and your goals for your harp’s sound. The strings that should be replaced most often are at either end of the harp. The top two octaves need changing more frequently because, due to their short lengths, any slight wear or damage can affect the harp’s ability to stay in tune as you change pedal positions. Over time, divots form where the strings are gripped by the mechanism. These divots can throw off the harp’s intonation and lead to unwanted snapping as well. At the other extreme, bass strings are not subject to the same kind of wear, but they lose a lot of their brightness and sustain over time. This change is insidious because it happens slowly and as you play from day to day you won’t notice the change. Once you change all of them, you will think you have bought a new harp, the sound will be so different. Since it’s hard to judge when your own harp’s wires are too old, adopt a schedule and replace them regularly, and you will never have to play tubby, dead-sounding wires again. Following the guidelines below you will help to keep the voice of your harp sounding at its best. When you’re estimating the cost of the various options, remember that the first and second octave strings are double (sometimes triple) length. Some manufactures now package the third octave in double length. Since a harp’s bass wires are thicker and stiffer than the rest of its strings, many harpists choose to avoid replacing their own, preferring to have a technician do the job during a regulation. But if you’d like to do it yourself, or one breaks and you have to do it for yourself, here are some tips to make the job go more smoothly. If the old wire isn’t broken, use your tuning key to unwind it from the tuning pin, while pulling it away from the harp with your left hand. This will help the wire uncoil from the pin, and will help prevent the sharp end of the wire from scratching your harp’s finish. When the wire is ready to come loose from the pin, pull it away from the harp. Coiled wire can have a mind of its own, so you want to keep it away from the instrument as soon as it comes loose from the tuning pin. If the old wire is broken you can uncoil it from the tuning pin and pull it off the harp, pulling away from the harp as above to prevent scratching. If the wire breaks just under the coil, you will probably need to use a pair of pliers to uncoil it and work it out of the tuning pin. Once the wire is loose from the pin, cut off the coiled end so that you can pull the rest of the wire through its hole in the soundboard. While uncoiling the wire from the tuning pin, pull away from the harp to keep the sharp wire end from scratching the finish. Make sure you have the correct wire. Each one is different, and installing the wrong one can put undue strain on the instrument. Grasping the end of the new wire, reach inside your harp’s body through a soundhole and locate the proper hole for the wire. I often place the tip of a finger over the end of the string to prevent it from scratching wood on the way in through the soundhole. Insert it in the correct string hole and pull the wire all the way through until its ball end stops against the inside of the soundboard. Give it a good pull to be sure it is seated, especially if it is a thick wire and you felt some resistance as you pulled it into place. Orient the holes in your tuning pin so they are pointing straight up and down. Feed the wire end through the tuning pin and pull it tight. There should be six inches or more of excess wire that has passed through the pin. Now you will need to let out some slack to allow the wire to coil around the tuning pin. You are aiming to coil the wire around the pin about three times once the wire is tuned to pitch. Place your left hand above the tuning pin and measure about three fingers of wire. If you feel your fingers are extra slim or extra thick, adjust up or down a little. You will learn the best amount with practice. Now let the wire down by the amount you measured. Once you’ve done this, bend the wasted end of the wire at the tip of the tuning pin to mark the length you’ve chosen for it. Measure “three fingers” worth of slack on the wire, then let it back down through the tuning pin hole. After letting the slack through the pin, bend the wire above the pin to mark then intended length of the wire. Next you need to start turning the pin and coiling the wire onto it. This is the trickiest part. The stiff wire will resist your efforts to coax it into a coil. As you turn the tuning key with your right hand, use your left to “herd” the wire into a coil. As much as this motion may feel tentative at first, it is actually easier if you go fairly quickly. This allows the wire less time to fight your efforts to control it. Once the wire is under some tension, make sure it is properly aligned through the discs or levers, and seated where it belongs on the nut. Tune it up to pitch. It will require several tunings before it holds well, but it does settle much faster than gut or nylon strings, and should be stable within a day or two. Keep your fingers on the wire to help guide it into a coil as you turn the tuning pin. When you’re finished, cut off the excess wire. A heavy duty end nipper makes this job easier on your hands. I recommend the Channellock. 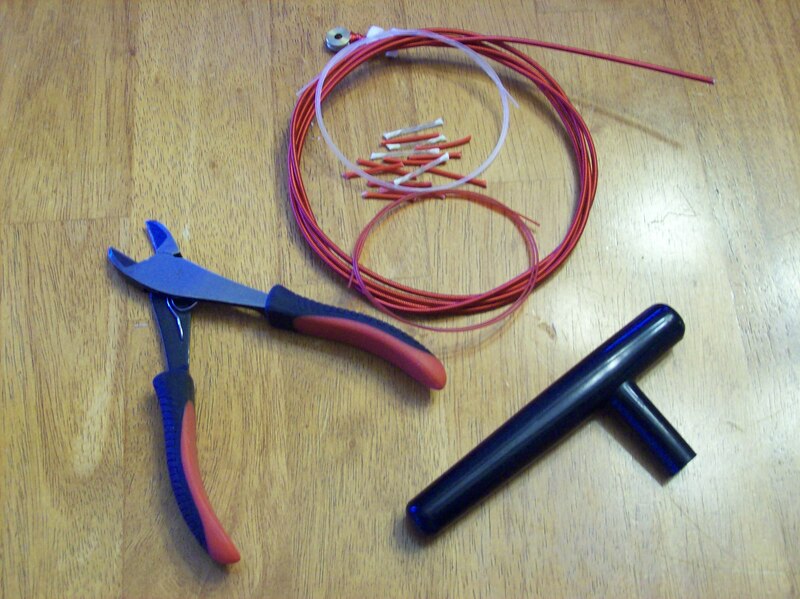 If you need to replace all of your wires, or want to practice this skill, start with the highest, thinnest wire. It will be the easiest to work on, and will help you gain some confidence before you tackle the really thick strings lower down. Take only a small number of wires off the harp at the time to minimize disruption in tuning stability. I usually replace four wires at a time, but if you’re new to this, try one or two at a time. Protect your eyes when replacing wires! those dangling ends can put an eye out, and when cutting off the excess, I’ve had bits of wire fly at my eyes. Wear safety glasses or goggles. Also, consider wearing gloves. Those wire ends are sharp. 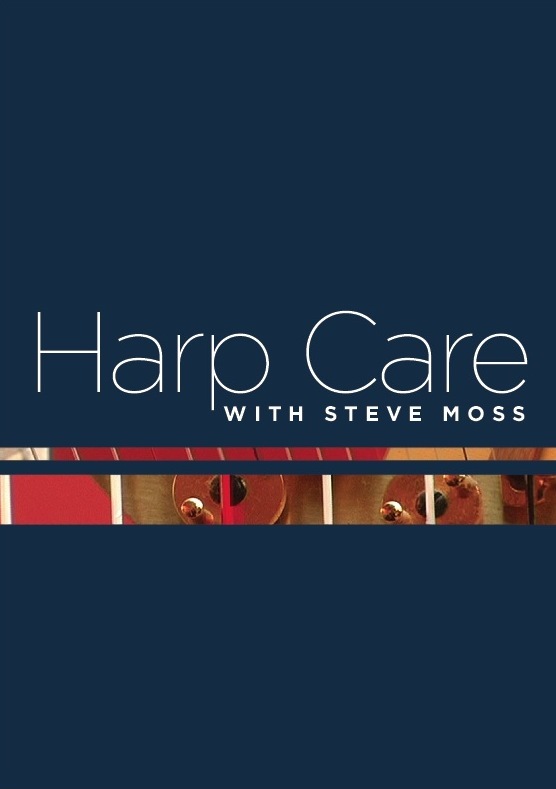 Here is another segment from my DVD, Harp Care with Steve Moss. In this one, I describe the different materials used in harp strings, give tips on how to know when your strings are due for replacing, explain the harp string numbering system, and show the tools used in harp string replacement. To learn more about the DVD and how to order it, click here. Does a Harp Regulation Include all new Strings? People often ask me if I’ll replace all the strings when they bring their harp in for a regulation. A smaller number of people assume that a regulation includes all new strings and are surprised (and disappointed) to find out that this isn’t the case. While I may replace a string or two at a regulation appointment, and I’ll often replace the bass wires, complete restringing requires a significant additional investment of time, and thus carries an extra labor charge. Then there’s the strings, which on a full sized pedal harp can cost close to $500 for a full set. I am always glad when my customers are willing to invest in new strings. A lot of harpists tend to leave strings on their harps longer than they should. I often work on harps whose strings have lost much of their tonal quality and sustain. I am happy to schedule the additional time to restring a harp before regulating it. However, I can’t offer the same-day service I can offer for a standard regulation. In order to completely restring and regulate a harp, I generally request that the customer leave it with me for three days. The reason for this time lag is that brand new harp strings don’t hold their tuning well enough for me to accurately regulate the harp’s intonation. Ideally, there should be a two-week lag between the day a harp is restrung and the day it is regulated, and someone should tune the new strings at least once a day. Since my road service regulation stops rarely last two weeks, I have to compress this “string settling and stretching” period down to a couple of days. I do this by tuning the harp over and over, accelerating the settling process. After two days of intensive tuning, while the strings will still stretch to some degree, they will hold their tuning well enough to complete the pitch regulation process. If you are interested in having your harp both restrung and regulated, please contact me in advance. We’ll need to work out a time for you to leave the harp with me, and there are decisions to make about which strings to order. You can use strings you already have on hand, but I caution you not to bother with them if they are more than five years old. Strings age even sealed in a package, so if your spare set goes back more than that, it’s better to throw them out and start fresh. Lever Gut vs. Pedal Gut: Which Harp String Do You Need? If you play a Lyon & Healy or Salvi lever harp, you may have noticed that these manufacturers, through their sister company, Bow Brand Strings, produce both “Lever Gut” and “Pedal Gut” strings. You might think that if you own a lever harp, you will want to buy lever gut strings, but it ain’t necessarily so. Both Lyon & Healy and Salvi produce two varieties of lever harp. Many of the best-known models, such as the Lyon & Healy Prelude, Troubadour, and Ogden, and the Salvi Ana, are designed as “starter pedal harps.” While they have no pedals, they are strung with pedal harp strings and mimic the tension, string spacing, and feel of a pedal harp. Other models, such as the Lyon & Healy Lyric and the Salvi Egan, are designed with folk and Celtic harpers in mind. They are generally lighter in construction and easier to carry, and they feature a lower string tension for easier playing and a brighter sound. The Lever Gut strings produced by Bow Brand (and available through harp.com, among others) are designed for use with these folk and Celtic harps. 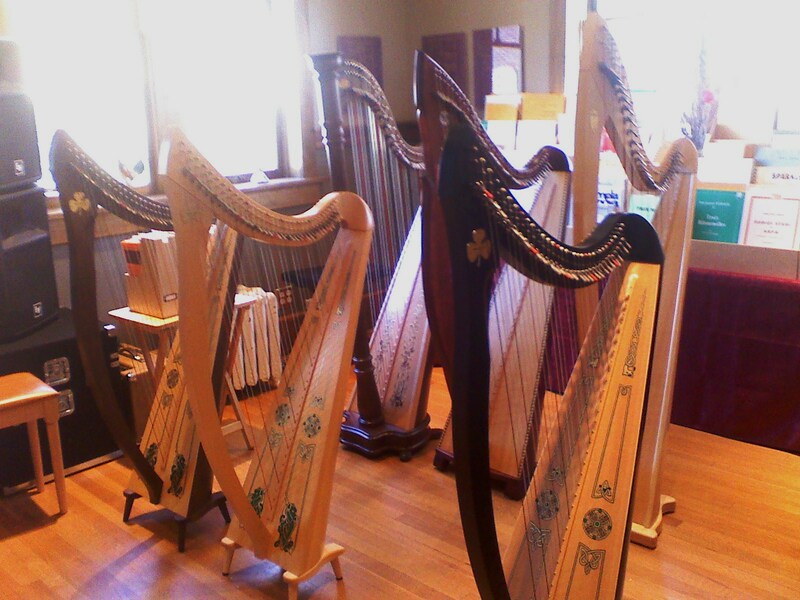 If you’re unsure of what strings to order for your harp, contact Lyon & Healy West. They can advise you over the phone, and send you a chart that shows which strings to buy for each model of Lyon & Healy and Salvi lever harp. No matter what make of harp you play, it’s a great idea to contact the maker and request a stringing chart if you don’t already have one. It’ll make replacing strings that much easier when the time comes.